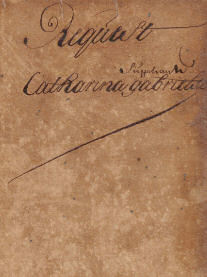 The Appendices to the Resolutions of Batavia Castle are miscellaneous documents received by the General Secretariat of the Governor-General and the Council of Dutch Asia in Batavia Castle. It is the largest series of documents in the archives of Batavia Castle: 763 volumes, amounting to 555.000 pages including approximately 25-30.000 separate documents. It is also the least well known series for historians. Systematic research of this archive has yet to be attempted. Simultaneously, a database entry with document descriptions will be produced and published. This entry will eventually provide access to a select number of documents. This unique series is important for both Asian and European (overseas) history. Some documents are directly related to the history of the south-central Javanese principalities, as well as other sultanates and their rulers in other parts of the Nusantara. For instance, there are a number of incoming letters and requests from rulers and regents, in particular from Priangan, West Java. These letters also include taxation lists of received diplomatic gifts and ‘gift projects’, namely the reciprocal gifts sent to Asian rulers by Batavia. Gift lists can be directly connected to the diplomatic letter database of this website through our search engine. A great number of documents deal with the VOC’s seaborne trade and other maritime matters such as consumption bills and cargo lists of arriving ships. Other documents are connected to the VOC’s business activities. These include reports relating to warehouses and trading items; military and personnel affaires. Many documents originate from Batavia’s civil institutions such as the yearly accounts of the city orphanage and diaconate; land surveys concerning the Ommelanden (Batavia’s immediate hinterland, present-day Jabodetabek) or building projects. They bring us into contact with the social world of Batavia. A great number of documents are from private Asian (in particular Chinese), Indo-European (mestizo) and European citizens who wrote requests to Batavia Castle for a variety of reasons. These documents are not only important for genealogical history, but they also bring us into contact with the local multi-ethnic societies in which the individual citizens of Batavia moved. You may download the data set here for your own research and analysis.